Abdimas: Papua Journal of Community Service, with registered number ISSN 2656-0070 (online), is a scientific multidisciplinary journal published by LPPM Universitas Muhammadiyah Sorong. It is at the national level that covers a lot of common problems or issues related to community services. The aim of this journal publication is to disseminate the conceptual thoughts or ideas and research results that have been achieved in the area of community services. 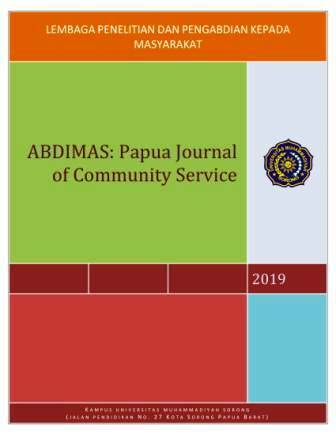 Abdimas: Papua Journal of Community Service handling and managing the various potentials, obstacles, challenges, and problems that exist in society. Implementation of service activities also involves the participation of the community and partners. Service activities are organized into an activity aimed at improving the welfare of society. Please read these guidelines carefully. Authors who want to submit their manuscript to the editorial office of Abdimas: Papua Journal of Community Service should obey the writing guidelines. In the following year of publication, the journal is going to publish biannually. Any interested author could submit the manuscript following the submission guidelines.